Due to The Small Size of Modern Notebooks an Optical Drive is Often Missing From The Components, Sibon Slim USB External DVD Drive Burner is Special Designed Give PC or Laptop Without Internal Drive. You Can Watch DVD Movies, burn Files, Movies to a CD/DVD, Install Software and Create Backup Discs Etc. -Interface: USB3.0 (also for 2.0). -Support DOS start and system recovery. -Compatible with all laptop and desktop with USB port. -Ability to correct errors, shockproof,low noise. 1. Please hook up the device to the direct USB port on your computer. If you connect it to a USB hub or extension cords, it maybe cannot recognize the Driver or not read the CD/DVD. 2. We suggest that you install VLC player to play CD/DVD. 3.Some external devices require enough electricity supply to operate properly, so make sure your laptop is plugged in to power cord or you use a powered USB hub on the notebook. 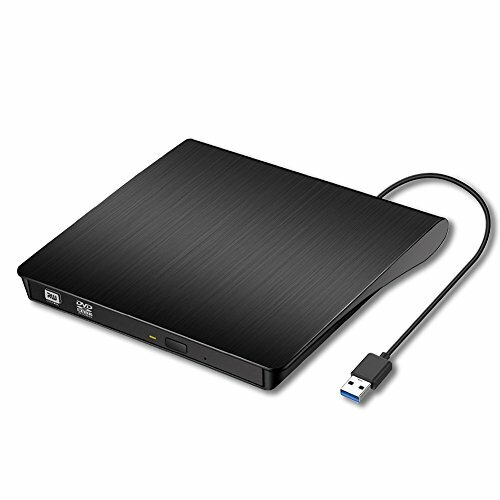 【USB 3.0 HIGH SPEED INTERFACE】- Sibon External DVD Drive With Advanced USB3.0 Technology Faster Data Transmission Speed More Stable Data Transmission. Also Compatible With USB 2.0. 【Compatible Systems 】 - The External CD Drive Works Compatible With Windows 2000/XP/2003/Vista/7/8.1/10, Linux And All Version Mac OS Systems, Supports Any PC, Ultrabook and Netbook. 【High Speed】- Portable External CD Drive For Laptop With Brand New Chip Supports All Major DVD, Support CD-R, CD-ROM, CD+/-RW, DVD-ROM, DVD-R, DVD+/-RW, DVD-R DL, VCD. 【EASY TO INSTALL & USE】 - No Need Extral Power Supply, No Need for Any Additional Software. Powered By The USB Port, Just Plug it Into Your USB Port And The DVD Driver Will Be Detected. 【100% High Quality】 - Sibon External CD Drive Embedded Cable Design, Made With Premium Wire Drawing Material, Offers 1 Year Warranty And We 100% Stand Behind Our Products. Any Questions, Just Contact us Freely. If you have any questions about this product by Sibon, contact us by completing and submitting the form below. If you are looking for a specif part number, please include it with your message.